Is life a doomed journey from a station called birth to a station called death with a bit of pleasure and a lot of pain sprinkled betwen. Though we rarely think of life in such stark terms, isn't that the unvarnished reality of life No, it isn't. Life has a higher, richer, sweeter dimension – a spiritual dimension - that we frequently overlook amidst the horserace pace of our current civilization. The Gita for Daily Enrichment makes life's spiritual dimension readily accessible throughout the year with its 365 brief reflections that can be read in just a few minutes. Meditate daily on the timeless wisdom of the Bhagavad-gita and enrich yourself with the sublime wealth of potent, pleasant and penetrating thoughts. Chaitanya Charan Das is a monk and spiritual teacher at ISKCON, Pune. He has done his Electronics & Telecommunications Engineering from the Govt College of Engg, Pune. He subsequently served as a software engineer in a multinational software company and also secured the first rank in Maharashtra in the GRE exam. Seeing the prevalent problems of stress, depression, addiction and overall misdi- rection - all caused by a lack of spirituality, he felt inspired to dedicate his life to the cause of jnana daan, offering systematic spiritual education, under the aegis of VOICE. 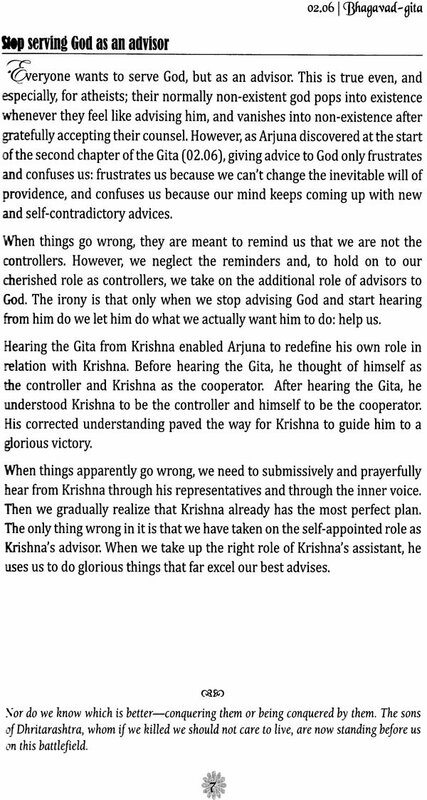 He is a member of ISKCON's topmost intellectual body, the Shastric Advi- sory Council, which offers scriptural advice to the GBC (Governing Body Commis- sioner). He is the associate-editor of ISKCON's global magazine, Back to Godhead. He conducts seminars at various reputed educational institutes all over India in- cluding IITs and NITs as well as leading MNCs. He has also presented papers as an on the interface of science and spirituality as an invited ISKCON delegate at na- tional and international conferences organized by UNESCO. He has written over five hundred articles. His writings have been published in newspapers like Times of India, Indian Express, Economic Times and Hindustan Times as well as global spir- itual magazines including Back to Godhead. His writings in English have been trans- lated into several foreign languages including German, Chinese and Romanian and several Indian languages including Kannada, Telugu, Bengali, Hindi and Marathi. He is the author of eight books: ENERGY - Your Sutra for Positive Thinking, Sci- ence and Spirituality, 'The Spiritual Scientist' series, volume 1, 'The Spiritual Scien- tist' series, volume 2, Recession - Adversity or Opportunity?, Why do we need a temple?, Frequently Unanswered Questions, ldol Worship or Ideal Worship? 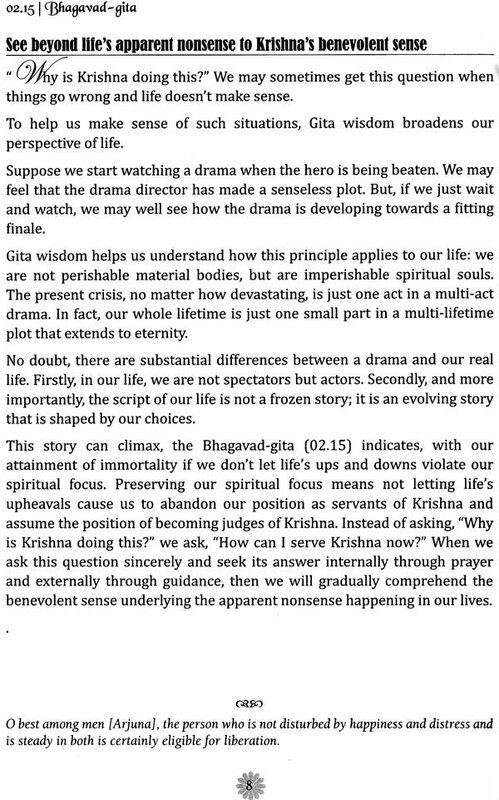 Gita for Daily Enrichment (referred henceforth as Gita-daily) provides condensed nuggets of insight gleaned from the Vedic wisdom-tradition, and re-presented in an idiom and style that resonates with contemporary needs, interests and concerns. 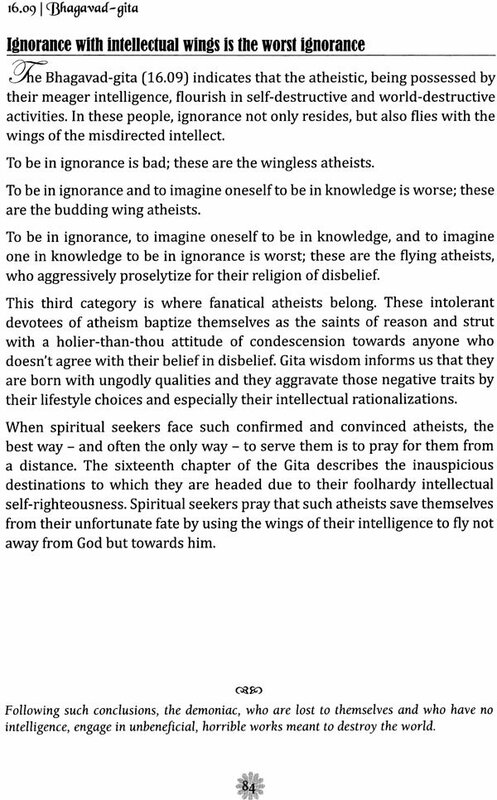 The Vedic (Indian) wisdom-tradition has provided lofty some of the loftiest philo- sophical insights in the world. 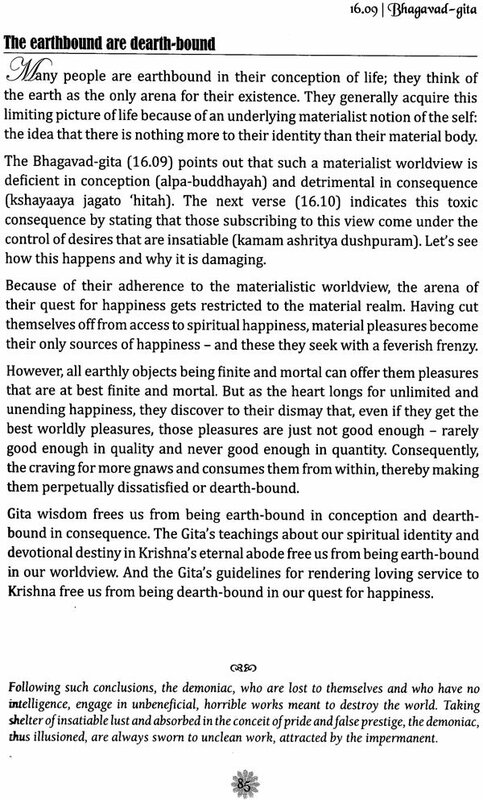 Gita-Daily makes the humble attempt to stimulate in- terest in Vedic thought by mining and bringing forth small nuggets of wisdom that the contemporary mind can find accessible, relevant and illuminating. 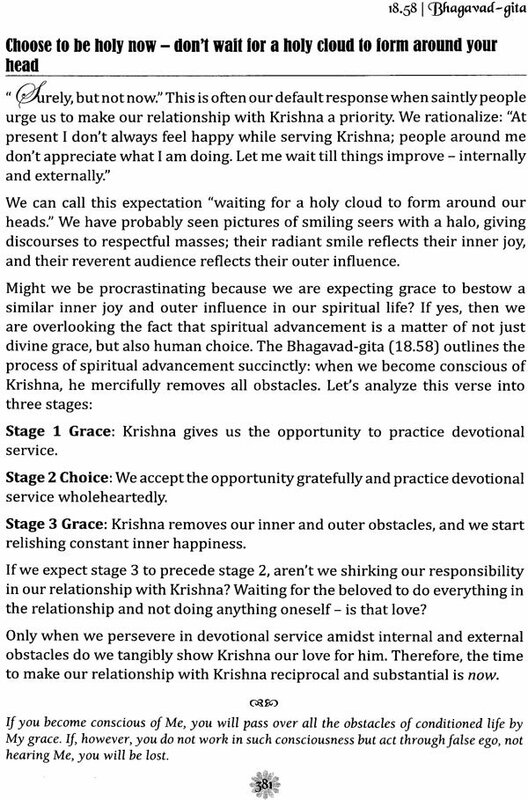 Gita-daily is also a humble attempt to fulfill on a daily basis the standing in- struction of my foremost spiritual teacher Srila Prabhupada, the founder-acharya of ISKCON, to all his followers to write at every opportunity: "Realization means you should write, every one of you, what is your realization. What for this Back to God- head is? You write your realization, what you have realized about Krishna. That is re- quired. It is not passive. Always you should be active. Whenever you find time, you write. Never mind, two lines, four lines, but you write your realization. Shra- vanamkirtanam, writing or offering prayers, glories. 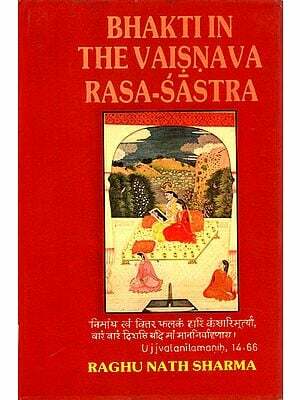 This is one of the functions of the Vaishnava." The articles in this book are a metamorphosed version of a personal journal of an individual spiritual journey. Over the years, while studying the sacred Vedic scrip- tures, whenever I would get an insight of how a particular verse or narrative or analysis addressed my concern, I would phrase that insight in my own words in my personal journal. During my various talks, I would often share some of these insights, gleaned from scriptures but re-presented in an intellectually and linguistically ap- pealing way. Many of those who attended these talks would tell me that they found these re-presentations illuminating, offering them a new light with which to see the la- tent wisdom in scriptural truths they already knew. Those giving such feedbacks often encouraged, even urged, me to put these insights into writing. Within the many books that comprise the Vedic library, I have chosen to focus on the Bhagavad-gita because it is simultaneously profoundly philosophical, unend- ingly inspirational and eminently practical. Over the last fifteen years I have studied the Gita dozens of times and have spoken on it hundreds of times. 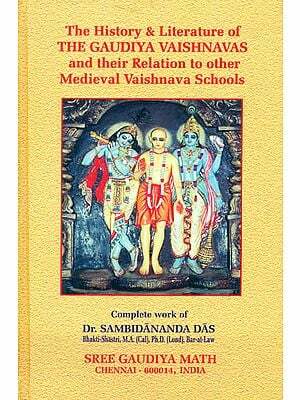 I have also taught the full Gita as a systematic course several times and have written scores of articles on it. Despite this repeated contact with the Gita, I am even now amazed by its un- fading freshness: contemplation on its verses brings rejuvenation, illumination and de- termination. I feel deeply indebted to the Bhagavad-gita for the sanity, clarity, gravity, tenacity and velocity that it has brought to my life. As an expression of my gratitude to the Gita, I feel impelled to do whatever I can to make its inspiration available as much as possible. But I also realize that most people in today's culture will not have the time or the facility to carry out an intensive or extensive study of the Gita. So the Gita-daily is my humble attempt to repay my debt to the Gita by making its wisdom comprehensible and accessible through daily nuggets of contemplation on one or more of its verses. As I am focussing on the inspirational potency of the Gita and not on its semantic intricacies, I generally don't quote either the Sanskrit verse or its Eng- lish translation verbatim, but present the relevant import of the verse, rendered ac- cording to the theme under discussion. 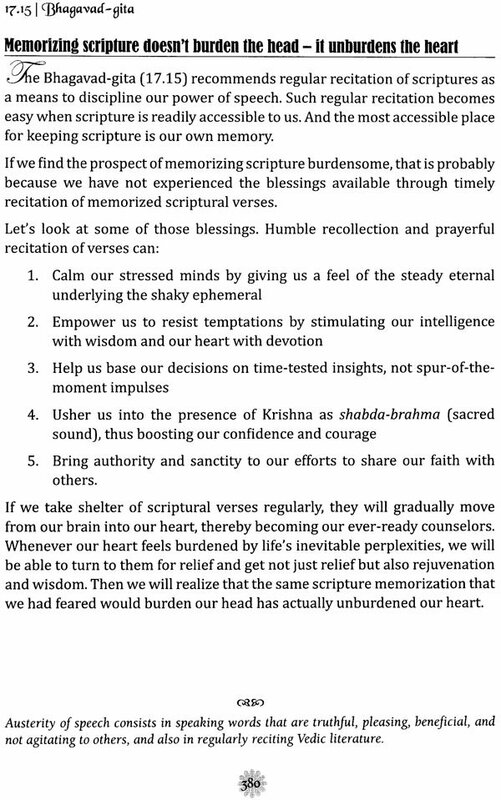 To ensure that these articles don't become too technical or academic, I also don't quote too frequently from the various Gita com- mentaries by erudite and saintly teachers. Nonetheless, I have provided at the bot- tom of each articlethe translation of these verses. If I quote more than one verse in an article, then the translation given at the bottom of the article is of the verse that is men- tioned in the article title. These articles are not a systematic commentary; they are brief meditations that I hope will prompt the readers to study the Gita more deeply through its commen- taries. For those wanting to take up such study, I wholly recommend Srila Prabhu- pada's Bhagavad Gita As It Is, which is the most widely distributed rendition of the Gita in English and is the source of the translations given in this book. I hope that you find Gita-Daily helpful in your spiritual journey in coming closer to the Gita and to its speaker, Lord Krishna, who is forever waiting for us in our own hearts.